William Monahan's crime romance will be paroled on Blu-ray this Valentine's Day. 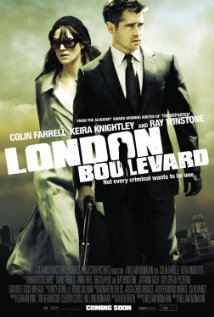 In an early announcement to retailers, Sony says 'London Boulevard' will have a Blu-ray release on February 14. Colin Farrell stars as an ex-con hired to look after a reclusive young actress (Keira Knightly) who finds himself falling in love, which puts him in direct confrontation with one of London's most vicious gangsters (Ray Winstone). The Blu-ray will feature 1080p video, a DTS-HD Master Audio 5.1 soundtrack, and the only supplement is The Making of London Boulevard featurette. You can find the latest specs for 'London Boulevard' linked from our Blu-ray Release Schedule, where it's indexed under February 14.